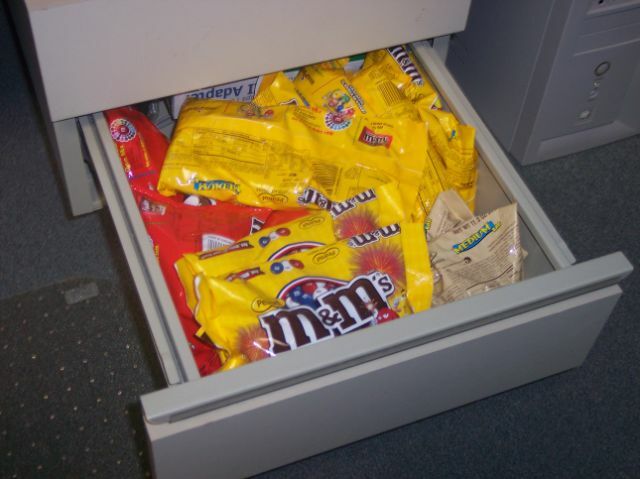 For a couple of years now I have been keeping M&M's on my desk. It started with the Free State Homecoming parade which goes right by our office building. A number of us ran out to collect candy from the street. Reason number 58 why this job rules. Anyway, I started buying the large bags of M&M's and offering them to whomever came to visit. Large consumers of my candy will bring in bags of M&M's to contribute, and I have a tip jar for the occasional spare change. My current stock is especially large, so I decided to share a picture. Here is my office desk drawer with roughly 15 lbs, $50 worth, of M&M's. Bring some home and give them to me! Have you considered getting a lock for that drawer?? You did just disclose the keeping place, you know.